One moment, Chloe Kerwin is laughing along with us as we bathe a common room in a new color. Milan Sachs and I are looking to see how Kerwin’s expressions and feelings change when exposed to different colors in a neutral environment. We were just transitioning from green to blue to yellow while blasting the likes of Ariel Pink and Tame Impala. There are slight differences with each changing of the light; her energy relaxes once the room becomes blue and Tame Impala gets into a slow riff, but throughout the whole session she mostly appears the same. That all changes once we switch to red. In an instant, the room becomes more intense with the color than ever before. We can all feel it and gasp at the sudden shift. I look over to Kerwin, who is by far receiving the most exposure to light, and ask how she’s feeling with this new development. “Anxious, I feel very anxious,” she replies. Her body language communicates this clearly. She’s fidgeting with her hands more than she was previously, and her eyes are darting around the room. This anxiety follows her during the next couple songs until Milan instructs her to sit up on the round table. It is then that Kerwin seems to bask in the red, taking it in and owning it. In our conversation following the shoot, she explained to me her surprise at the different moods the red light brought out of her. Among them were happiness, power, anger, and love. Much of this was coinciding with the music we were playing, especially when “Rock With You” by Michael Jackson came on, and a spark appeared in her eyes. We had to tell Kerwin to be still more than a few times as she compulsively swayed to the music. “It reminded me of my uncle’s house, when I was ten, I would come over and he would play Michael Jackson, and we would sleepover and dance.” For a song as strong as that, or “This Must Be the Place” by Talking Heads, the association of color actually morphed along with the sound. 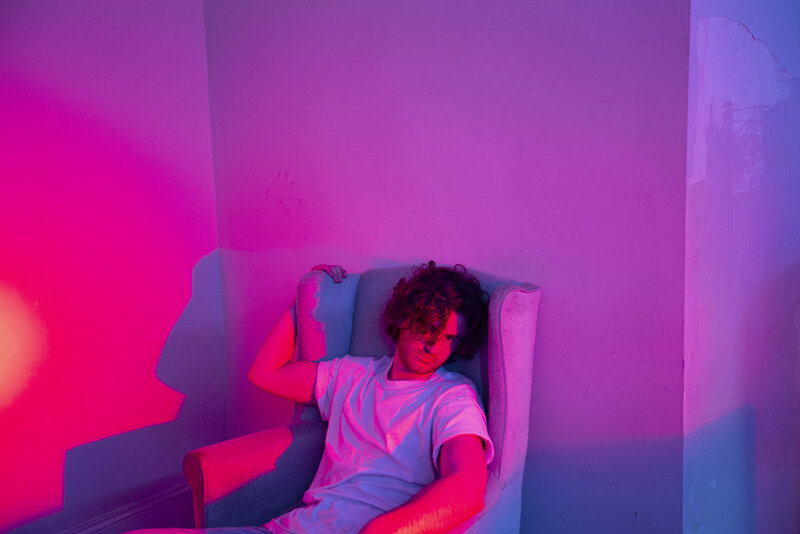 Our shoot with Jasper Cote revealed stronger emotions, as we allowed him to choose each song and tell us the corresponding color it made him feel. With “Just Like Heaven” by The Cure, Cote wanted a similar red to Kerwin, and channeled the same power and energy as he clutched the lounge chair he sat in and stared straight into the camera. 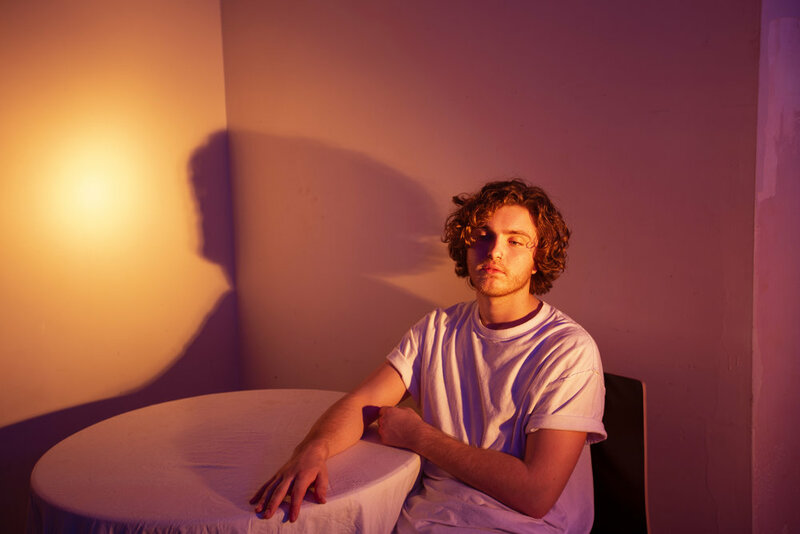 He told me about how the song was about an ex-relationship and had a very positive connotation, but about halfway through his thoughts drifted to memories of his band Pool Boys and a recent trip they took to New York. “It was one of the happiest memories I had in recent times, and came into my head so naturally. I think there’s power in that,” said Cote. If there was anything Milan and I could take away from this shoot, it was that there is an uncertain power in the ability of color to bring out feelings. In everyday life, we are surrounded by colors that poke and prod constantly at how we feel. How to control this, and how to know which color is affecting what remains a mystery.